Starting with a homemade pizza dough, I topped it a layer of mozzarella cheese, shredded romaine lettuce, and slices of plum tomatoes. When it came time for the bacon, I used 2 kinds - regular bacon and Canadian bacon. Having both on the pizza made it meatier and tastier... besides, you can never have too much bacon! The Canadian bacon baked along with the pizza while the traditional bacon was cooked in advance and added on just at the last minute of baking (to prevent it from burning while the pizza baked.) Since this pizza didn't have a sauce, I served it with ranch dressing on the side which was ah-mazing! As for baking, I tried something different and baked the pizza in my cast iron skillet. I didn't feel like free-forming the dough for the crust so I pressed the dough into my skillet for the perfect shape. Needless to say, it came out perfectly! I may have to bake all homemade pizzas in my cast iron skillet going forward since the crust was golden brown, rose just enough around the edges and it maintained the traditional circle shape. I'd recommend baking your next pizza in a cast iron skillet! Sprinkle the cornmeal on the baking sheet (I used my 12 inch cast iron skillet) before placing the pizza dough on the sheet. Press the dough to create the crust and place on prepared baking sheet. Brush the top of the crust with olive oil. Top the pizza with 1/2 cup of mozzarella, followed by the shredded lettuce. Place the Canadian bacon on top of lettuce layer and top with slices of tomato. Sprinkle the other 1/2 cup of mozzarella over the tomatoes. Bake the pizza in the preheated oven for 10-14 minutes, or until the bottom of the pizza is crisp and golden. 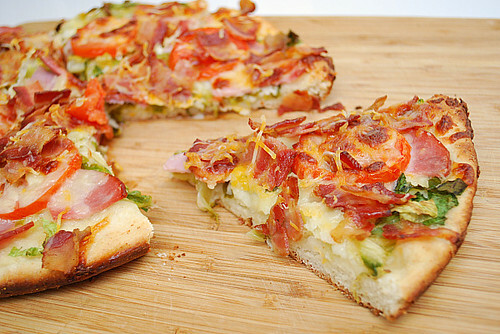 Remove the pizza from the oven and top with the crumbled or chopped cooked bacon and return to the oven to bake for another minute to heat up. Just before serving, sprinkle the colby jack cheese and serve with ranch dressing if desired. You constantly post such great recipes and photos. I love love love that you made this in your cast-iron skillet. This would make it so much easier and appealing for me. I must try this out! I love the versatility of cast iron skillets! Before I had a pizza stone, I'd make pizza in my skillet. So easy! 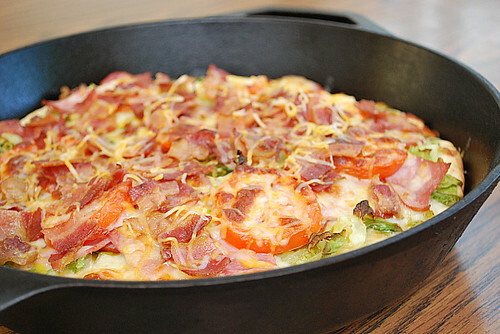 I have never thought to bake a pizza in my cast iron skillet, but this seems like a fantastic idea. Definitely going to have to give it a whirl. What an awesome idea! I'm totally gonna try making pizza in the cast iron skillet now! Your pizza looks delish! I've never though of using a cast iron skillet. Brilliant idea. If you're ever looking for a super thin crust version of BLT pizza, try Dino's Pizza on Higgins by the Harlem el stop. They bake the cheese and bacon on a cracker thin crust, then add mayo, lettuce and tomato on top. The hot pizza with the cool, crispy toppings is a wonderful combo. I'd only recommend it for eating in though, cause the hot pizza can make the lettuce wilt. Happy eating!